Apacer, as the global leader in industrial storage and memory, will participate in the Electronica Expo 2018, showcasing the latest industrial products and technologies which include industrial grade 3D TLC NAND, TCG Opal 2.0, CorePower and rugged memory XR-DIMM solutions. Apacer will focus on six applications including IoT, server & networking, transportation, defense, gaming and healthcare. Due to the continuous development of applications for IoT, storage devices are increasingly being sought to meet high standards of stability, performance and capacity. As a part of Apacer’s continued efforts to bring excellent products to market, we have been very strict with the adoption of flash chips used in our memory modules. 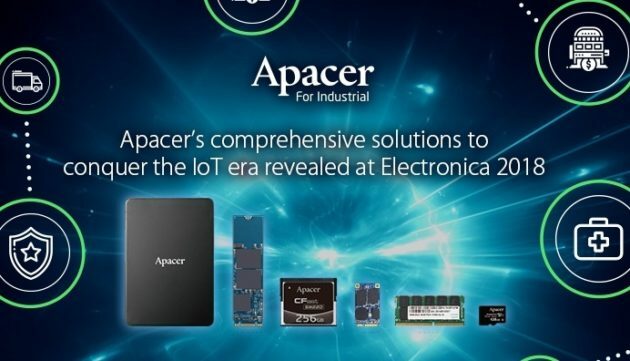 Targeting industrial applications, Apacer is launching brand new industrial 3D TLC NAND solutionsthat adopt 64-Layer BiCS3 structure and are equipped with over-provisioning technology to help optimize SSD performance, alleviate memory wear and prolong SSD lifespan. The ability to operate within a wide range of temperatures (-40°C ~ +85°C) means that even under severe conditions, Apacer 3D TLC NAND SSD products will still deliver outstanding performance. The development focus of Apacer 3D NAND based industrial SSD products includes PCIe, 2.5”, M.2, mSATA, MO-297, CFast, SDM, uSSD, USB drive, etc. Apacer’s storage devices compliant with the TCG Opal standards provide significant advantages over software-based encryption in terms of performance, security, and management. With the implementation of hardware encryption, users can benefit from better performance. There is no burden on the host system and no extra host encryption elements required because all security functions take place within the device itself. In response to the General Data Protection Regulation (GDPR) that has come into force in the European Union, Apacer has stepped in with TCG Opal-compliant SSDs as demand surges for impregnable data security solutions, giving self-encrypting drives (SEDs) a strong foothold in the industrial SSD market. Supporting products include 2.5″, M.2, mSATA, and MO-297. As SSDs are often deployed in harsh and extreme environments, data becomes vulnerable. Power loss can certainly pose a potential threat to data integrity. For SSDs built with volatile DRAM buffers, damage can be even more severe because data can be lost if power failures occur before the cached data is moved into the non-volatile NAND Flash. To ensure data integrity and the stability of data transmission in the event of power outage, Apacer has developed the hardware-based technology called CorePower. CorePower equips SSDs with electrolytic capacitors and an IC detector that can deliver urgent power current so that the flash controller can take this extended moment to flush cached data and essential metadata into NAND Flash blocks. Apacer’s CorePower products come in a variety of form factors, including 2.5″, M.2, mSATA, MO-297, and CFast. Apacer’s XR-DIMM uses the innovative board-to-board connector design to fit tightly and securely onto the motherboard. In addition, it adopts the highly durable 300-pin connector and mounting holes to effectively prevent memory modules from dislocating due to vibration or shock. This greatly improves the reliability of memory signal transmissions, serving as the strongest support for all the applications. Its connector design meets the anti-vibration and anti-shock standards of MIL-STD-810 and ANSI/VITA 47-2005. Furthermore, it supports underfill, anti-sulfuration, conformal coating, and wide temperature technologies which ensure stable operation even in severely harsh environments. Apacer’s XR-DIMM is compatible with DDR4 2133/2400 specification, supports ECC function and comes in two capacity choices of 8 GB and 16 GB. Apacer has years of experience in the storage market and is backed by a strong R&D team. The company has received recognition from the industry for its professional and prompt service. Apacer will continue to innovate and keep our unchanging mission which is to help our customers enhance their market competitiveness. We will uphold our original vision of ‘trustworthy and reliable’ to serve our customers to the best of our ability while expanding Apacer’s territory in the storage market.